Erna B. Krostag, 100, Marshfield, died on Sunday, August 6, 2017 at Atrium Post Acute Care in Marshfield. A Mass of Christian Burial will be held at 10:30 am on Wednesday, August 9, 2017 at St. John’s Catholic Church, Marshfield, where the family will receive relatives and friends from 9:00 am on Wednesday until service time. Rev. Samuel Martin will officiate. Burial will take place in Gate of Heaven Cemetery. Rembs Funeral Home is assisting the family. 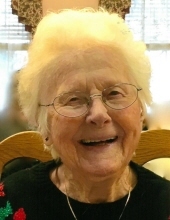 Erna was born on January 7, 1917 in the Town of Cleveland, Marathon County, to Wilhelm and Emma (Diechmann) Hagen and received her early education at the Johnson one room school house. She later completed her education by earning her G.E.D. Erna was united in marriage to Arnold J. Krostag on July 22, 1935 in Waukegan, IL. He died on July 21, 1966. On October 12, 1973, she was married to Roman J. Krostag. He died on October 14, 1981. Erna worked at St. Joseph’s Hospital and the Marshfield Clinic, retiring in 1984. She continued to volunteer at the Marshfield Clinic for the next 30 years. Erna was a member of St. John’s Catholic Church, the Parish Council of Catholic Women, the Missionary Society, Adult Choir and the Marshfield Senior Citizens. In Erna’s younger years, she was a gifted seamstress and she loved to knit and crochet. Her grandchildren always knew that Christmas meant new mittens, scarves or slippers. Erna loved to dance and was always first on the dance floor when she heard a polka. She also enjoyed playing cards and cribbage. Erna is survived by her sons, Arnold (Sandra) Krostag, Harker Heights, TX and Charles (Julie) Krostag, Portage, IN and daughters, Yvonne Tenke (Paul Nett), Weyawega, WI, Joni Clausen, Largo, FL and Donna (Bob) Schultz, Marshfield, WI. She is also survived by 28 grandchildren, 88 great grandchildren and 22 great great grandchildren. Erna was preceded in death by her parents, her husbands, Arnold and Roman, 6 sisters, 1 brother, daughters, Carol Folz and Betty Andrew and sons-in-law, John Tenke and Cal Clausen. Memorials may be designated in Erna’s name to the Lawton Center or Columbus Catholic Schools. "Email Address" would like to share the life celebration of Erna B. Krostag. Click on the "link" to go to share a favorite memory or leave a condolence message for the family.